With only my haphazardly packed weekend luggage, a oneway ticket for the boat to Lido, and a fresh batch of jet lag… I started my journey through the canals of the majestic city of Venice. I had just returned from my jaunt through Asia via Bangkok, Bali, Singapore, and Tokyo, when the opportunity to start my summer off in Europe quickly materialized. My first stop on my trip, was the Queen of the Adriatic, the sinking city… Venezia. I had only seen this cities marvelous setup in the likes of big hollywood movies. The scenes of acquiring keys to a wooden boat just in the knick of time to escape a plotted ambush or visions of James Bond perusing the canals after sending in his “resignation” flashed through my mind as we weaved past gondolas, under bridges, and eventually up to our charming hotel on the Grand Canal. The city was buzzing from the Architecture Biennale that was taking place on the east end, and the streets were filled with the throngs of summertime tourists scarfing down gelato and skipping across the pedestrian bridges, selfie sticks in hand. For me, I didn’t find the real Venice during a simple serenade of “That’s Amore” in my overpriced gondola ride. 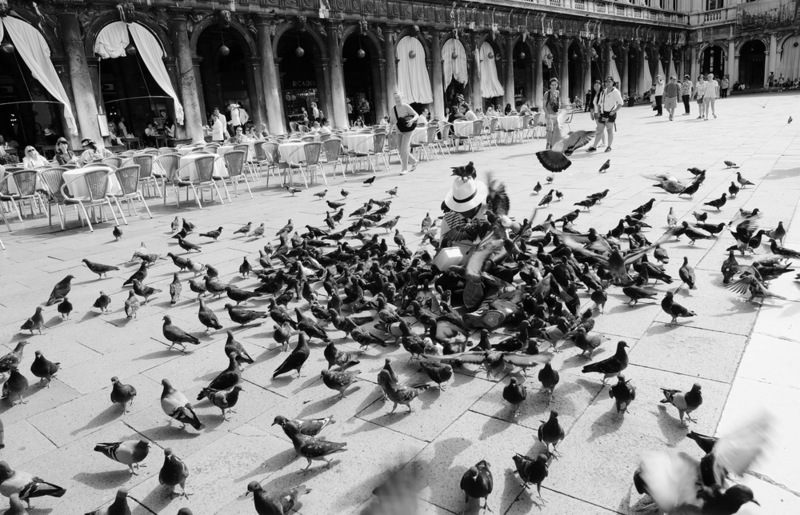 And it wasn’t in the square of Saint Marco, with its large bell towers and sea of pigeons. I found the real Venice in all her beauty in the misty morning, far before any tourist had opened their sleepy little eyes. The night before, a vigorous thunderstorm rolled in over the city sending travelers and locals scurrying for an awning, a cafe, or whatever form of shelter was nearby… I on the other hand snuck back to my hotel and was put almost immediately to sleep from the cooing of the raining and the booming of thunder. I woke at 5:30am the next day, flustered that I had crashed so early the night before. With the sun lightly peering in through my venetian window… I was summoned to the damp streets below. I walked along the corridors of my sleepy hotel until I reached the Grand Canal exit. I begin meandering down small streets with no direction, maps, or cares. And that's when I saw her. The real city, her real beauty was then and there for me to admire. 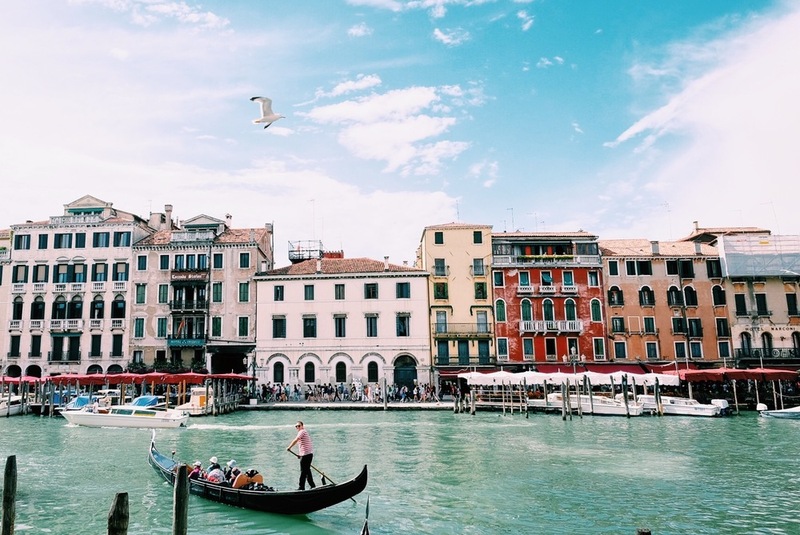 I mindlessly followed the sounds that interested me, from a morning phone call taken from the balcony overlooking the small canal, to the sound and smell of the fresh fish being loaded into the Rialto Market before the big day ahead. 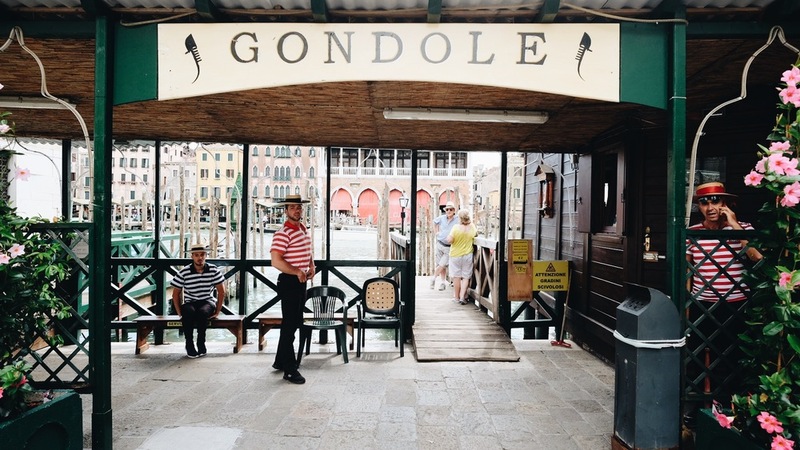 I followed three men in striped shirts until they turned off to their respective gondola stations, where they slowly unwrapped their protected, precious boats like christmas presents. I said “Buongiorno" to the street cleaner who was happily humming as he cleaned up the debris from the nights storm. I admired the buildings, freshly washed in the rain, that were vibrant in hue and elaborate in decor and to me, this was the real Venice, a regal queen wise and beautiful, filled with charm and subtle romance. I got to see a glimpse of her knowing face before she turned back into the bustling city of hopeless lovers, tourists, and lackluster cuisine… and to be honest, I wasn’t even mad. Because I got to see her, and I knew how she really was.